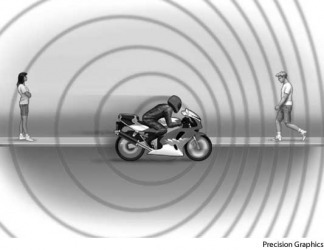 Doppler effect As a motorcycle speeds forward, the frequency (and pitch) of the sound waves in front of the motorcycle become higher, and the frequency (and pitch) of the sound waves behind it become lower. The Doppler effect is defined as a noticeable change in the frequency of sound, light or water waves as the source and the observer move. An example of the Doppler effect is that the frequency of the sound increases as the source moves closer to the observer. "Doppler effect." YourDictionary, n.d. Web. 09 April 2019. <https://www.yourdictionary.com/doppler-effect>. A change in the observed frequency of a wave, as of sound or light, occurring when the source and observer are in motion relative to each other, with the frequency increasing when the source and observer approach each other and decreasing when they move apart. The motion of the source causes a real shift in frequency of the wave, while the motion of the observer produces only an apparent shift in frequency. Also called Doppler shift . The difference between the frequency of a wave (as of sound or light) as measured at its source and as measured by an observer in relative motion. The Doppler effect can be used to determine the relative speed of an object by bouncing a wave (usually a radar wave) off the object and measuring the shift in the frequency of the wave. This technique is the basis of Doppler radar, as used in traffic control and navigation systems. The Doppler effect is also known as the Doppler shift. A Closer Look The whistle of an approaching train has a higher pitch as the train approaches than when it recedes, even though that same whistle, heard by a passenger on the train, maintains a constant pitch. This is an example of the Doppler effect, common to all wave phenomena (in this case, a sound wave). Motion toward the source of a wave (or, equivalently, motion of the source toward the observer) entails that the peaks and troughs of the wave are encountered more quickly than if there were no motion, so the frequency of the wave is higher for the moving observer (hence the higher whistle pitch). Similarly, motion away from the source entails following the wave's motion, so the peaks and troughs are encountered less often, and the frequency is lower for the moving observer (hence the lower whistle pitch). The Doppler effect on light waves has enabled scientists to determine that the universe is expanding. The frequencies of light given off by various substances (such as the burning of hydrogen in the fusion reactions of most stars) has been found to be lower in distant galaxies and other celestial objects, a phenomenon called red shift, since the visible light is shifted toward the red, low-frequency end of the spectrum. Astronomer Edwin Hubble reasoned that the red shift was due to the Doppler effect. As galaxies speed away from us, the frequency of the light emitted appears lower. Doppler radar and sonar use the Doppler effect on reflected radio and sound waves to distinguish between stationary and moving objects and to determine the velocity of moving ones; the echolocation of bats and some whales also exploits the Doppler effect on reflected sound waves for navigating and catching prey. The apparent change in frequency or wavelength of a wave that is perceived by an observer moving relative to the source of the waves. From Johann Christian Andreas Doppler, the scientist who first proposed this effect. The change in electromagnetic frequency that occurs when the source of the radiation and its observer move toward or away from each other. The faster they come together, the higher the frequency. The faster they move away, the lower the frequency. Discovered by Austrian physicist Christian Doppler (1803-1853), this condition has a great effect on low-earth orbit (LEO) satellites as they weave towards and away from the earth. See Doppler radar.